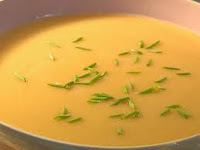 I used this recipe from Alton Brown as a guideline to make Potato Leek Soup the other night and it was great. I did not have heavy cream or buttermilk (I really do not like to cook with them anyway), so I added a little milk at the end to make the soup a little creamier - but for those who do not want to use milk, it really did not need it. Also, I used half chicken broth and half vegetable broth but I think you could use either. The recipe made enough that I was able to freeze some. Enjoy! Chop the leeks into small pieces. In a 6-quart saucepan over medium heat, melt the butter. Add the leeks and a heavy pinch of salt and sweat for 5 minutes. Decrease the heat to medium-low and cook until the leeks are tender, approximately 25 minutes, stirring occasionally. (c) 2011 Television Food Network G.P.